Pick a Resource That’s Important – Identify a resource that’s highly coveted in your niche. Think about insights you can give to others on ways to save that resource. For example, if you write in the Crafts and Hobbies niche, you might have a few ideas on how to speed up the cross-stitching process to save time. From there, write a title that exemplifies the information you plan to share. You may share one process in steps or several different methods for the process. Share Why it Matters – Write an introduction that describes the importance of the method you’re sharing and how it will help you save the resource. The introduction should make it clear exactly why your article is important and pull the reader into being interested in more. Develop the Method(s) of Saving – Make a list of the process or methods. Be as detailed as you feel is necessary to help your readers fully understand the process. Format this section as a list to clearly break down the steps. Spell Out the Benefits – Explain how the process can help. Also, share how your method is different from the conventional method. Give Possible Areas Requiring Caution – If your process has any adverse effects, you owe it to your readers to share them. For example, if you write in the Travel and Leisure category, you may write some articles about budget travel. Articles in this niche usually include tips for saving money while on vacation. However, you need to mention the possible negatives of saving (e.g. paying less for airline tickets may mean sacrificing comfort on the plane). Conclude With Recap of the Process – The conclusion should give a quick recap of the process(es) and how it works. Also, this would be an appropriate time to encourage readers to find their own saving techniques. You, too, can share your own saving techniques with this simple template. Think about what that could do to your brand and credibility as an Expert Author! 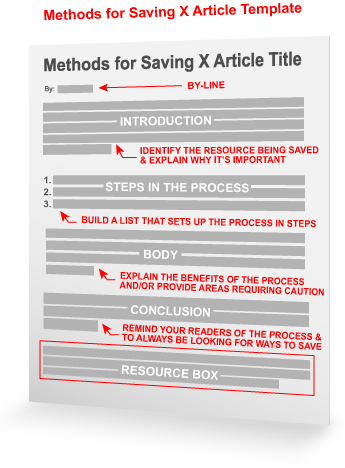 For your next article, consider undertaking the writing of a Methods for Saving “X” article. Then, once you’ve completed at least one, come and tell about your experience, or ask questions if you’re unsure how to proceed, in the comments section below. Want more templates like this? Check out the original 52 Article Templates and browse our Build Your Own Article Templates which feature 15-writing prompts and interactive PDF templates per package. Both are available at the EzineArticles Shop! Wow. That article was so meta. If anyone needs a good example of a “Methods for Saving X” article, this one fits the bill. we all get stuck occasionally for ideas. this will tickle the gray cells a little. Thanks guys, that’s really cool. Makes life simpler. What a good idea: and really reader focussed too. When I submitted my first article to you in April 2008, I estimated that I’d “dry up”after writing 10—-perhaps 20 pieces max. You’ve published nearly 150 and I’ll reach that target before Christmas. I’ve even managed to avoid resorting to #HAHD. The constant encouragement, helpful hints and ideas of you and your people have been of inestimable value. And who knows? one day I just might accept the #HAHD Challenge. Feel free to use my comments as you see fit. Yes, this one is definitely a keeper! Excellent example to use to write better. Hi Christopher, I know I have made that mistake several times & I appreciate you keeping us informed on how we can make the submission process painless. This is great article, it helps a lot, I have been using the techniques coincidently to write to piano lovers to help then master the art of playing the piano. But now I’m very clear about it. Great tips on organising ones thoughts for writing. Templates help us in so many ways. Do you have one for “life”? LOL! Your ideas are fantastic. Especially the management of time, resources and energy supporting each other. What a great model! This works perfectly on those days when you have a topic and ideas, but the mind is too fuzzy to put it all together coherently. Templates and paint by numbers is a good way to describe this. Just came across this template idea, and I love it. This one in particular is a nugget of gold.